Ride one of Wales’ most famous cycle routes, The Five Valleys Sportive, on 3rd September 2017 for Prostate Cymru! 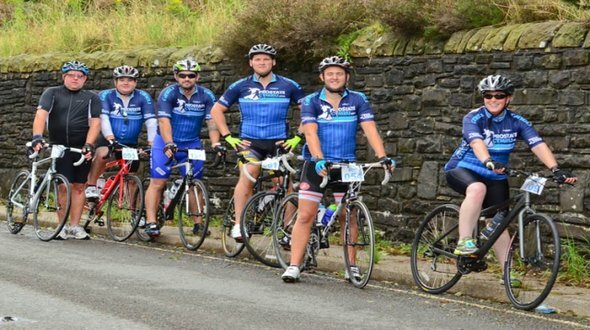 This challenging and exciting sportive has been held annually since 2013 in aid of Prostate Cymru to help raise awareness and support men in Wales with prostate issues. There is a choice of two routes available to participants: 54 miles and 72 miles. The history of the Five Valleys route comes from an event which was started as a road race by the Port Talbot Wheelers in 1958 and grew to become one of the most famous races held in Wales. The reason for its popularity was because it was an arduous course taking in some of the most historical climbs in South Wales such as the Bwlch and Rhigos mountains. It was the only race in Wales which was given a Star Trophy status – this rating is now called the Premier Calendar. Since the historic route has become The Five Valleys Sportive, Welsh sporting stars have completed the cycling challenge. Olympic gold medallist Nicole Cooke MBE and former Welsh international rugby players John Devereux, Richard Webster, Rhys Williams, Gwyn Evans, Gareth Cooper, Ray Giles and Dafydd James have cycled alongside participants in the sportive. If you would like to take part in The Five Valleys Sportive 2017 please visit www.thefivevalleys.co.uk and click ‘Enter Today’. The entry fee is £25 if you book online before the registration deadline. There will also be an opportunity to register on the day of the event for £35 if you miss the registration deadline.